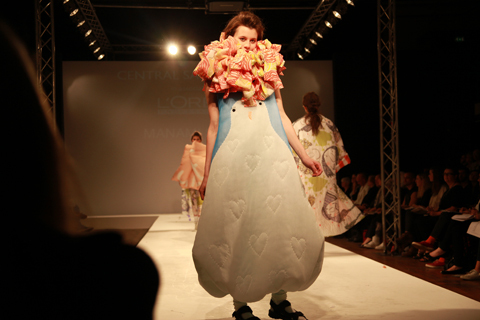 ﻿ Amelia's Magazine | Central Saint Martins: Ba Fashion Graduate Show 2011 review. Japanese. 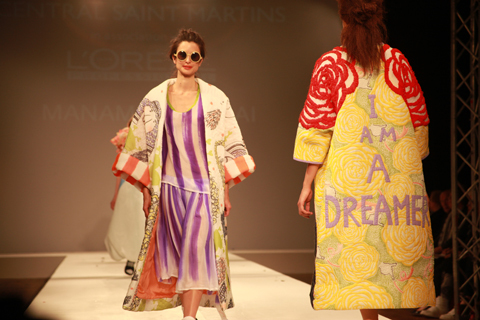 Central Saint Martins: Ba Fashion Graduate Show 2011 review. Japanese. 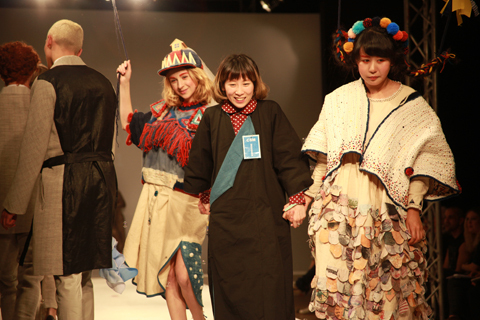 A distinct Japanese flavour ran through some of the collections. 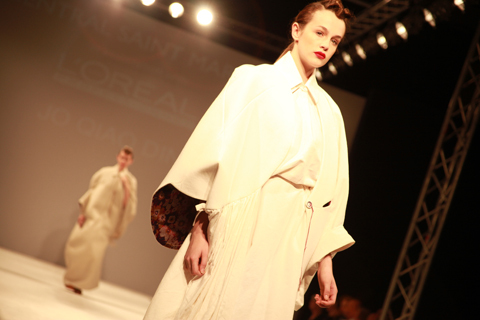 It was particularly strong with the outstanding kimono-esque robes of Jo Qiao Ding. 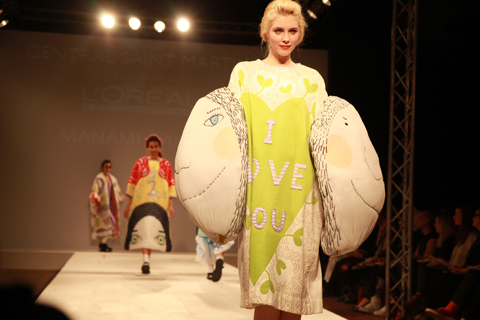 And check out Manami Sakurai's cute quilted dresses. Jo Qiao Ding by Harriet Alice Fox. 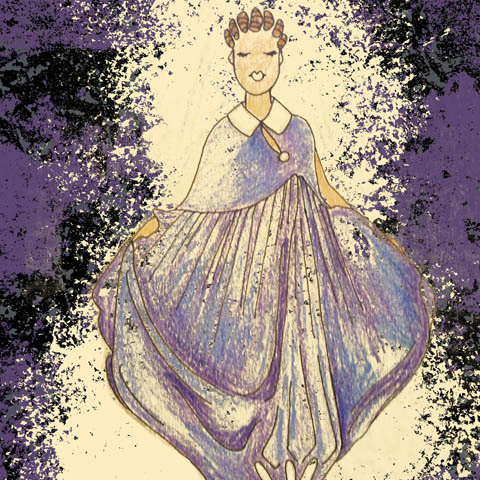 With so many students from abroad it’s hardly surprising that there was an exotic element to the Central Saint Martins collections from 2011′s graduating students. Japan seemed to be a particularly strong reference point, see in all it’s multi-faceted glory. 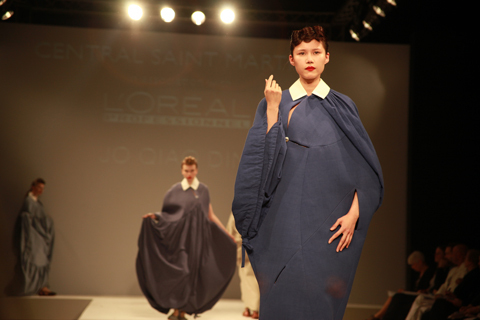 Jo Qiao Ding produced a standout collection: huge billowing kimono-esque robe dresses that gaped at the arms to reveal patterned underlining. White collars made the look thoroughly modern. Manami Sakurai by Kristina Vasiljeva. 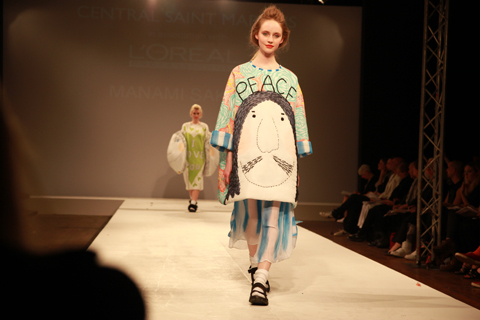 Manami Sakurai brought an inimitably cute Japanese streak to the show with quilted animal and face dresses bearing the embroidered words PEACE, thumb I Am A Dreamer and I Love You. 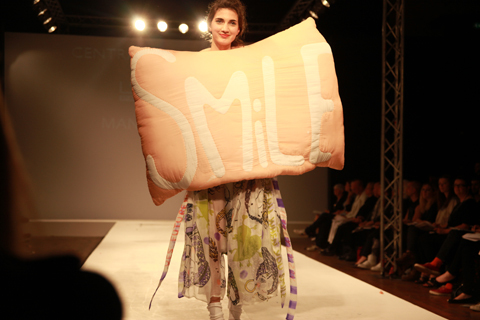 For the denouement a girl opened a floppy pillow cradled in her arms to reveal the letters SMILE several feet high. It was hard not to. Manami Sakurai. All photography by Amelia Gregory. 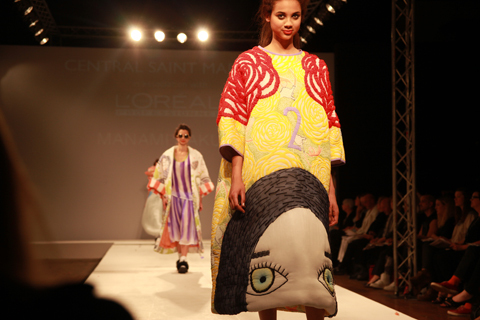 Runner up for the L’Oreal awards, Momo Wang, also brought a distinct sense of Japanese style to the show. 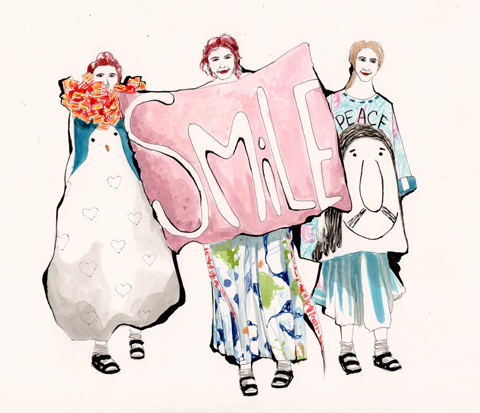 Her smiling models in many colourful layers reminded me of photos taken in the Harajuku area of Tokyo. 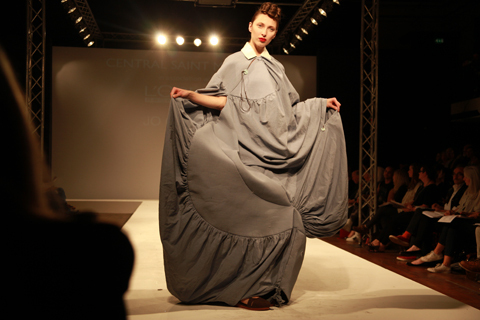 Central Saint Martins: Ba Fashion Graduate Show 2011 review. Knitwear.